Things keep moving in Brazil, and Azul keeps growing. I believe Avianca Brasil had about 10 percent of the market, so this might vault Azul into being the biggest airline in the country. BA just keeps killing it with these retro liveries. I have always loved the Landor scheme, and it still looks just as good as it did before. It just feels so British. What’s funny is that this airplane actually wore the Landor scheme when it was delivered. It’s time for another blast from the past. Buzz is back, albeit as a Polish charter operator owned by Ryanair. It’s actually just Ryanair Sun being renamed. I’m not sure why they’re bothering. What possible benefit would BA see in painting their 747 in one of their old schemes? Does it drive up ridership? Does it make their employees happy? Marketing ploy, isn’t it that simple? They are getting more than enough free media coverage as a result of these re-sprays. Beason – I think it’s the latter primarily. Employees are the ones who care most about liveries and history, and this helps to tap into that legacy. Plus, the 100 year milestone (even though it’s questionable, KLM is the only one that is truly 100 years old this year) is worth celebrating. So it’s a good excuse. It’s their 100th anniversary this year. They’re doing four aircraft, one in each of the old schemes. I doubt it drives up ridership but allows them to demonstrate that they are experienced (with the assumption being people will associate that with reliability and quality). I’d rather they redid some of their old adverts, in HD/widescreen. The scale and ambition of “The Face” is seldom seen in airline advertising these days. Cranky,How can I see the response comments from your article on the grounding of the MAX (March 14). In the past we were able to see comments of others. You sent me a comment from Striker, but I have not seen any other comments. Surely there were some that agreed and disagreed. 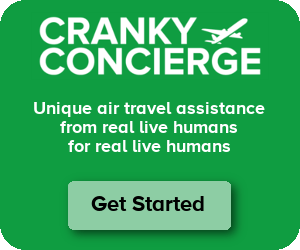 marytravels – Comments are sent to you but you can always just go to crankyflier.com and see the comments on all posts. Is the Ryanair Sun launch related to Brexit? By placing it in Poland it means access to low cost labor and they’re squarely in the EU? CLTflyer – No, Ryanair is already based in Ireland, so it’s not subject to that problem. Ryanair UK, however, is needed for that reason. I assume this had something to do with cheap labor when they started it, but I don’t actually know much about it. first was VARIG, which itself was near collapse and (correct me if i’m wrong here), essentially re-invented itself was GOL. Then they gained TAM, only to have the Chilean Supreme Court put their thumb on the scale and pretty much dictate which alliance they are allowed to keep, indirectly. the only silver lining for Star is that there is no longer hidden turf war and hostility over UA’s equity holdings of Azul, and now instead of everyone doing their own thing, maybe Avianca BOG could truly embrace Azul in their quest to become an equal rival to LATAM. They’re even cool enough to embrace COPA, despite most saying otherwise, perhaps Avianca should be the one who personally invites Azul to join. The Landor is by far my favorite BA livery. Very classy.